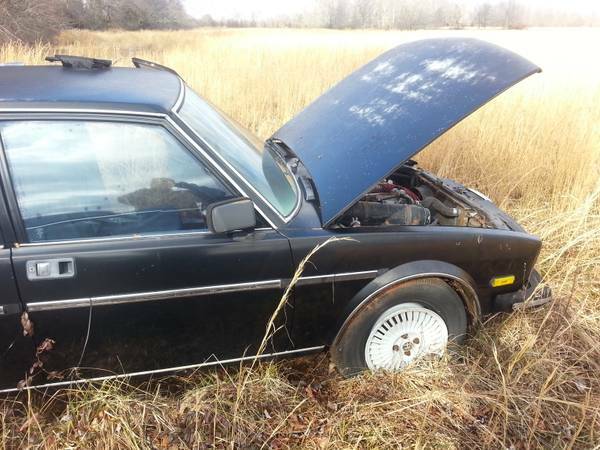 It’s part of this site’s unofficial mission to feature every reasonably priced forlorn Alfetta out there, as the RustyButTrusty Alfetta GT was part of the inspiration for many of the cars featured here. That started with a lucky find in the storage lot of a trailer park, with a car that had some recent repairs but still looked rather rough. However, it was nearly complete and solid in many critical areas, and you can see what that turned into. 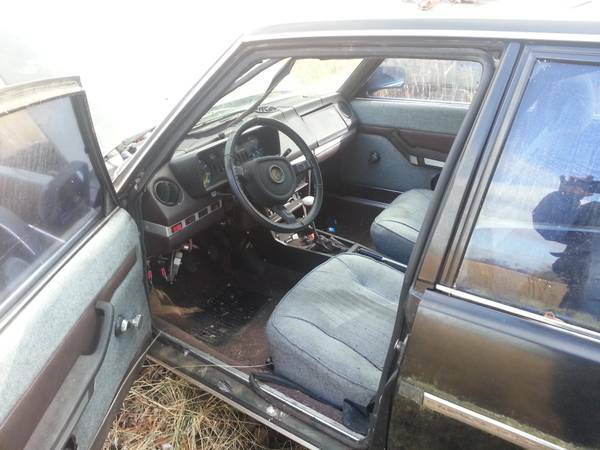 Anyhow, let’s take a look at this 1978 Alfa Romeo Alfetta Berlina for sale for $1200 in Hazel Green, AL. As is often the case in online classifieds, the pictures leave much to be desired – if you’re already out there, why wouldn’t you capture a couple of shots of the entire car? From the picture, you can see that this is the later style Sport Sedan, and that it’s got a flat on the front tire. The paint seems somewhat oxidized, but not hopeless, and what’s visible of typical rust areas like the fenders and windshield surround look to be solid. 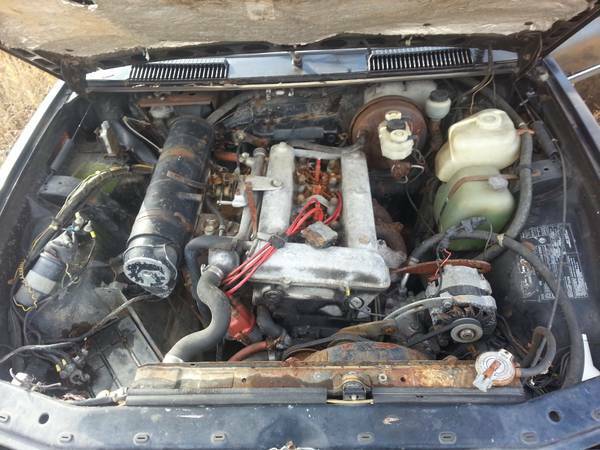 The body is probably 75% of the battle with these, with the driveshaft and transaxle making up the remaining 25%, so you’re already in decent shape here if the pictures are a good indication. Some of the trim has dropped from the a-pillar, but otherwise the interior actually looks decent. Assume that the material has oxidized somewhat and will start splitting once you use it regularly, but even slightly ripped up seats are better than seats with suspicious stains or bad smells. Everything looks complete and largely intact, and the 1978 cars escaped the tacky faux-wood trim. The car was apparently subjected to a carburetor conversion at some point – not necessarily a bad thing, but any gearhead would have to admit that the mechanical SPICA is a pretty cool piece of engineering, with its piston-like plungers and a cam making it look quite similar to an actual engine. However, many more people will be readily familiar with carbs and how to service them, while the SPICA does require a specialist, or at least your purchase of a manual from the Alfa club or the SPICA specialist, Wes Ingram. With that exception, everything looks pretty intact and rust-free. This car is even equipped with air conditioning, which, even if not terribly effective, can be used to defog your windshield pretty quickly. So who’ll step up to rescue this field find? This entry was posted on February 14, 2015 at 5:21 pm and is filed under Feature. You can follow any responses to this entry through the RSS 2.0 feed. You can leave a response, or trackback from your own site. Agreed, though the cheaper way is not always the most fun – buying my cheap Alfetta sure was a fun (and sometimes frustrating) way to learn about the car, plus it’s kind of cool to be able to say you did it yourself (though unfortunately that doesn’t extend to body work in my case).